John sets out to explore the mysteries inside Holmesburg. In the end, he is afraid he might not make it out. In GHOST STALKERS, two men who have had near-death experiences explore one of life’s biggest unanswered questions: what happens after you die? Chad Lindberg is a ghost hunter and actor best known for his roles in the Fast and the Furious and Supernatural. John E.L. Tenney is a renowned paranormal expert, author, and investigator. Chad and John seek the answer to what’s on the other side using state-of-the-art paranormal investigation equipment and conducting their own solo overnight explorations in America’s most haunted places. In last night’s episode, John E.L. Tenney and Chad Lindberg investigated the abandoned Old Taylor Memorial Hospital in Hawkinsville, Georgia, where thousands of lives began – and ended. After negotiating a storm of paranormal activity, their investigation culminated with an astonishing discovery caught on camera that most researchers spend their entire lives hoping for. There have been reports of a shadow person at Old Taylor Memorial, but this is no shadow person. According to John, this looks like a solid human form that reflects light rather than absorbs it. But who – or what – could it be? Who, or What, Did the Camera Capture Walking Past This Doorway? In Sunday’s episode, John E.L. Tenney and Chad Lindberg investigate a mysterious vortex at the abandoned Old Taylor Memorial Hospital in Hawkinsville, Georgia. In its heyday, Old Taylor Memorial was the only hospital around for miles, where life began – and ended – for thousands of people. John and Chad negotiate a storm of paranormal activity over the course of two harrowing nights. Their investigation culminates with an astonishing discovery caught on camera that most researchers spend their entire lives hoping for. Tune in to see for yourself! The lost spirits of thousands of deranged patients might be haunting this abandoned asylum. In Sunday’s all-new episode, John E.L. Tenney and Chad Lindberg investigate an abandoned insane asylum in Maryland. Former patients are said to haunt the grounds, and some believe Springfield State Hospital’s unique natural environment may have created a portal to the ghost world that casts a dark show over the whole town. Now, for the first time ever, the hospital has opened its doors to paranormal investigators. Over the course of two nights, John and Chad discover why it’s been such a closely guarded secret. You can use lasers to see ghostly movement or portal openings to the spirit world. Listen to the disembodied moan of this possibly tormented spirit. October 12, 2014 - Destination America's Ghostober hits us with Ghost Stalkers. Ghost Stalkers is new paranormal programming produced exclusively for Destination America by Ghost Adventures' Nick Groff. Ghost Stalkers features actor (Supernatural, The Fast and the Furious), paranormal enthusiast, Chad Lindberg and paranormal author and investigator, John E.L. Tenney. The duo had early in life near death and back from the dead experiences which helped spur their interest in the paranormal. As per the Ghost Stalkers press release, Chad and John seek the answer to what’s on the other side using state-of-the-art paranormal investigation equipment and conducting their own solo overnight explorations in America’s most haunted places. First get past the title of the show, which is meant to be enticing to the dramatic set. After watching the first episode of the six-episode series, Ghost Stalkers has many aspects of paranormal shows that have aired in the past or are currently airing (EVP sessions, investigating, evidence reveal). The first episode's location is at Whispers Estate in Mitchell, Indiana. The historical tidbits seem to focus more on the darker side of the property's existence à la Ghost Adventures. A source attached to the show revealed that portals, "ghost portals," and the existence of portals will be a large focus of the series. Yes, there was plenty of portal talk. Ghost Stalkers has a stripped down investigative style, no large team investigating here.The men's solo investigating makes for more focused cerebral, deeper experiences. Although I'm not convinced of the new tech (wormhole detector) brought in on the investigation. I do like when shows try new technology. From what I've seen of the show, it hits on more of what a real paranormal investigation is like. The first episode contains unexplainable, possibly paranormal activity. Chad Lindberg is fired up over spirit communication and John E. L. Tenney finds out if the spirits can keep their hands to themselves. Oh and that sweet ride! Christiane Elin is involved in the paranormal community. She is a paranormal investigator. Sneak peeks of the premiere episode of Ghost Stalkers below. Ghost Stalkers - Reports of violent hauntings and non-human entities drive John and Chad to investigate a possible portal at the Whispers Estate in Mitchell, Indiana. Ghost Stalkers - David Rountree sets up his wormhole detector, and Chad and John are convinced it is picking up the signals they need to do this investigation. (Silver Spring, Md.) – Near-death experiences may be the closest we ever come to knowing what exists on the “other side.” Many of those who have seen the proverbial white light say they returned to life with a sudden sensitivity to the spirit world, and it’s believed that people who are sensitive enough can glimpse through and even enter places – portals – that bridge our realm with the hereafter. 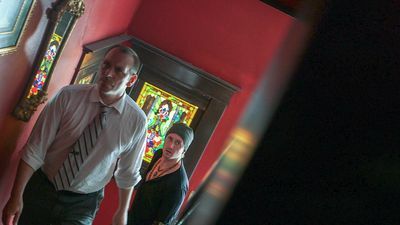 In the all-new series GHOST STALKERS, produced exclusively for Destination America by Ghost Adventures’ Nick Groff, two men who crossed over investigate the afterlife that they encountered for a brief, eye-opening moment by exploring American locations that are rumored to house doorways to another dimension. The six-episode first season of GHOST STALKERS premieres Sunday, October 19 at 10/9c as part of Destination America’s week-long Ghostober stunt, which also includes an all-new episode of ALASKA MONSTERS on Friday, October 17 at 9/8c followed by the one-hour special KILLING BIGFOOT at 10/9c. Actor Chad Lindberg, best known for his roles in the Fast and the Furious, October Sky, and Supernatural among others, nearly died at seven-years old and has since possessed a sensitivity to paranormal activity. Renowned paranormal expert, author, and investigator John E.L. Tenney was brought back from the dead at age 17 and has dedicated his career to learning more about what’s beyond the white light. In GHOST STALKERS, Chad and John seek the answer to what’s on the other side using state-of-the-art paranormal investigation equipment and conducting their own solo overnight explorations in America’s most haunted places, including a 200-year old Tennessee plantation never-before featured on television and a small-town Georgia hospital that doubled as a funeral home. In the premiere episode, “Whispers Estate” on Sunday, October 19 at 10/9c, reports of violent hauntings, goat-like demons, and bizarre shadow creatures drive John and Chad to investigate a possible ghost portal at the Whispers Estate in Mitchell, Indiana. The estate was once home to Dr. John Gibbons, who went insane after his daughter died in a second-floor fire. Over the course of two nights, John and Chad explore whether the spectral attacks are the work of Dr. Gibbons and his family or of something far more evil. The closer they get to the truth, the more they find themselves in the house’s crosshairs. Chad Lindberg has built a successful and versatile career in the film and television industry with such memorable roles as “Jesse” in the original The Fast and the Furious, “Odell” in October Sky opposite Jake Gyllenhaal, “Matthew” in I Spit on Your Grave, and fan-favorite “Ash” on the hit show Supernatural. Lindberg discovered his passion for the paranormal as a young child, following a near-fatal bout with complications arising from Reye’s Syndrome. After being read his last rites, Lindberg miraculously survived and has since had a sensibility and curiosity surrounding ghosts. He has been investigating the paranormal for four years. Taking what he’s learned and experienced along the way, Lindberg now leads his own paranormal ghost tours, giving fans tours of haunted locations across the country in search of ghosts and answers from the beyond. John E.L. Tenney is one of the most well-recognized investigators of paranormal and occult phenomena in America. The author of more than a dozen books and host of the paranormal podcast Realm of the Weird, Tenney has been actively involved in the fields of UFOlogical, anomalistic, and conspiratorial research for almost three decades. He is one of the few private individuals to be invited by the Vatican to personally witness an exorcism. Tenney’s journey into the paranormal began when he was pronounced dead at the age of 17. After his heart stopped for two-and-a-half minutes, the harrowing, profoundly negative experience he had prior to being revived changed his life forever. He has since dedicated his life to the pursuit and sharing of knowledge, in order to create a more well-informed community. Destination America is the only network to celebrate the people, places, and stories of the United States. The inclusive network targeting Adults 25-54 is available in nearly 60 million homes, emblazoning television screens with the grit and tenacity, honesty and work ethic, humor and adventurousness that characterize our nation. Destination America features travel, food, adventure, home, and natural history, with original series like BBQ Pitmasters; A Haunting; Mountain Monsters;Buying Alaska; Buying the Bayou; and Railroad Alaska. For more information, please visit DestinationAmerica.com, facebook.com/DestinationAmerica, or twitter.com/DestAmerica. Destination America is part of Discovery Communications (Nasdaq: DISCA, DISCB, DISCK), the world’s #1 nonfiction media company reaching more than 2.7 billion cumulative subscribers in 220 countries and territories.